Vindaloo is a Goan dish. Goa, if you haven’t heard of it, is a city on the west coast of India. Interesting thing about Goa. That’s where the Portuguese landed when the came. Who cares you ask? I do. You should too if you like Indian food. The Portuguese brought chili to India. They brought potatoes as well but chili was the big one. Before the Portuguese the Indian’s had pepper. Don’t get me wrong. I like pepper. But I like chili better. Imagine a vindaloo without chili. Imagine an Indian restaurant that spiced everything with nothing but pepper. See my point? Here’s to the Portuguese! 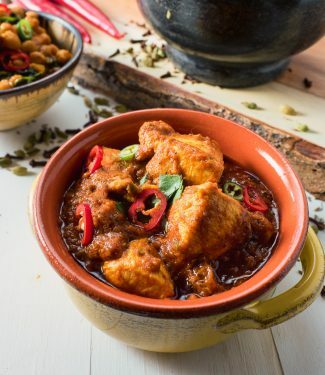 This is a master Indian restaurant vindaloo curry recipe. You can make it with pre-cooked chicken, lamb, beef or use paneer, pre-cooked potatoes, lentils, mixed vegetables or fried eggplant for vegan options. If you have not read the guide to Indian restaurant technique yet, do it now. It has pictures to help you understand the recipe. There’s also a guide to Indian ingredients in that post. Indian restaurant vindaloo curry can be as hot as you like it. Just up the amount of chili powder for a little hotter. Or use hot chili powder to really crank up the heat. 1 tsp hot Indian chili powder (optional) - 1 tsp is burning. 2 tsp is screaming. Your call. When the oil starts to shimmer add the garlic ginger paste and cook, stirring constantly, until it stops sputtering. Add the cilantro and green chili and cook for 15-20 seconds, stirring constantly. Turn the heat up to medium high. This is important. The heat is what caramelizes the onion in the curry base and gives the curry it's Indian restaurant flavour. As you become more comfortable with this technique try pushing it. Add the diluted tomato paste and stir until bubbles form (the oil will likely separate). This takes around 30 seconds to one minute depending on the heat. Mix in the malt vinegar, sugar and optional tamarind sauce. Turn the heat down to low and add the pre-cooked lamb, beef or chicken. 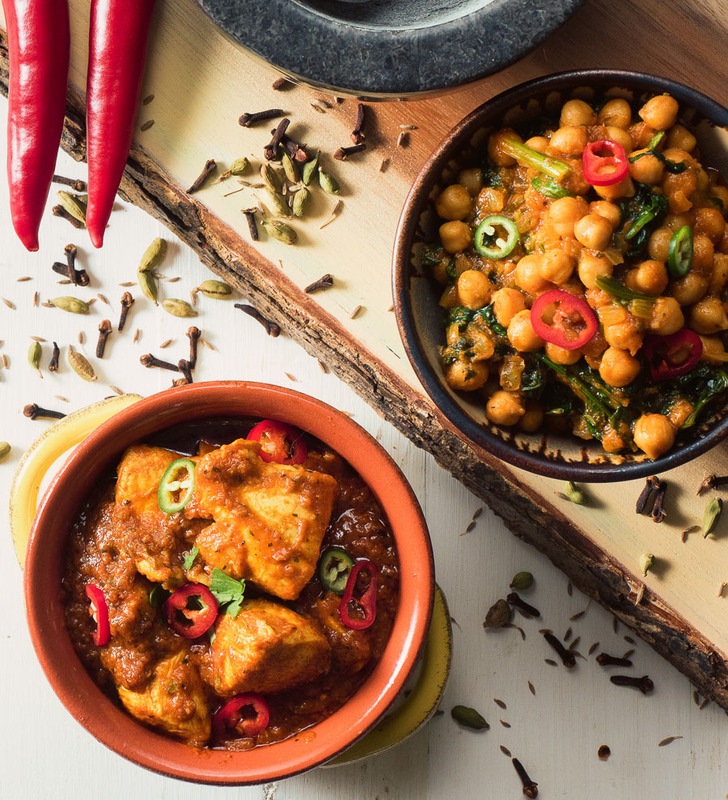 If you don't have madras curry powder the recipe for indian restaurant spice mix is here. It works too. I made your curry base and this vindaloo for the first time today. It was excellent. My only comment is that the tamarind sauce I used was a bit strong (quite sweet like ketchup) and I think I would prefer to use tamarind juice (made from a block of tamarind pulp) instead next time, unless that would water it down too much? Tamarind paste from pulp would be good I bet. It’s more work but I am going to try it next time! PS: I made pork vindaloo, as that was the best curry I had in my 6 months in india. I wasnt sure how long to boil the pork for, I did 20 mins but I think it might need 45-60 mins. I also think that frozen king prawns would work nicely in this dish. Depends on the pork. If you were using pork shoulder you would need to simmer it until tender which might take up to an hour. I don’t think a leaner cut like loin would be great no matter how long or short you cooked it. Prawns (or shrimp) work but you have to be super careful not to overcook them. Into the sauce raw and simmer until just done. Ive noticed a lot of the recipes are only for 2 people i am planning to cook for 4 so should i simply double all ingredients & curry base ? Unfortunately it doesn’t really work that way. The flavours rely on the ability to get the pan hot enough to caramelize the curry base. Doubling the recipe puts too much base in the pan. What I do is make the curry twice. The first batch holds well in a small saucepan over low heat. Made this last night was a winner, added extra chilli as we like it spicy. Glad you liked it. I try to spice recipes medium hot so people can crank the heat up or down to their taste.